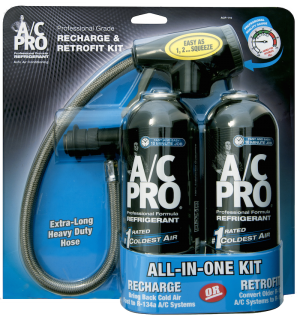 Professional Formula R-134a Refrigerant All-In-One Recharge & Retrofit Kit for cars that were manufactured with R-12 (freon). Replaces lost refrigerant and oil in automotive A/C system. Special anti-wear additives extend system life and improve performance. System safe leak sealer stops most common A/C leaks in hoses, gaskets and O-Rings. Reusable Trigger dispenser with built in low-pressure gauge and temperature dial indicator. Extra long 24” recharge hose for accessing hard to reach service ports. New easy coupler attaches simply by pushing on the port. Includes two 12-ounce cans of A/C Pro.